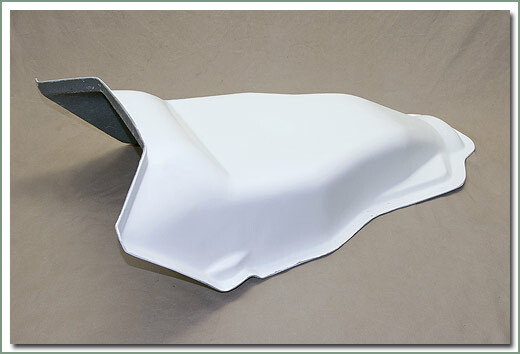 New sheet metal and fiberglass parts such as fenders, hoods and other body sections need to be test fit to the vehicle prior to sending the parts for paint and body work. It is industry standard that new parts such as these be fitted to the vehicle first before the finish is applied. Metal parts come painted with a rust prohibiter and require proper preparation before final paint is applied. 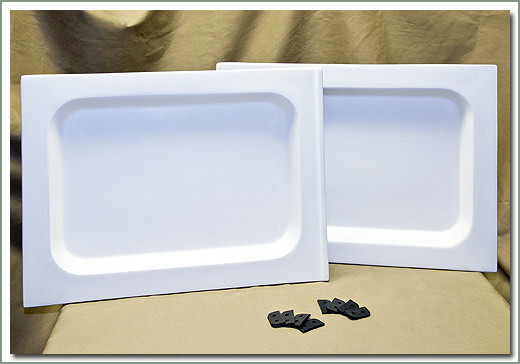 Fiberglass parts come finished with a final gel coat and require proper preparation before final paint is applied. Proper preparation may include several coats of primer, sanding between coats and body filler before final paint is applied. SOR will not be responsible for paint and body work. Hardtop cracked? Rain gutter rusty and leaking? 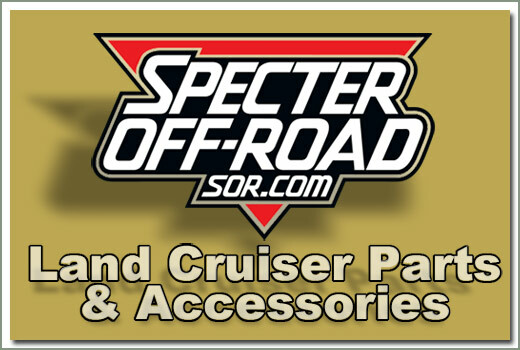 Specter has the answer with the aftermarket Fiberglass Roof Panel at a significant savings over the stock Toyota part. Hardware and weatherstrip must be purchased separately. Minor drilling may be required. Comes with fiberglass rain gutter (not metal). Same shape and design as factory top. Comes in white. Must be shipped by truck. Does not fit top with corrugated sides and no corner windows. 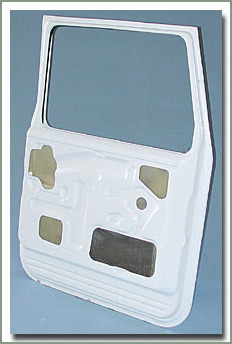 Fits 1965-1984 FJ40 and BJ40 tops with rear corner windows. Does not fit top with corrugated sides and no corner windows - White with no painting needed - Minor drilling may be required - Comes with fiberglass rain gutter - Does NOT come with hardware or weatherstrip - Must be shipped by truck - Drop ship only, check for current price & freight quote. SOR's Fiberglass Transmission hump is another great aftermarket replacement part that is no longer available from Toyota. 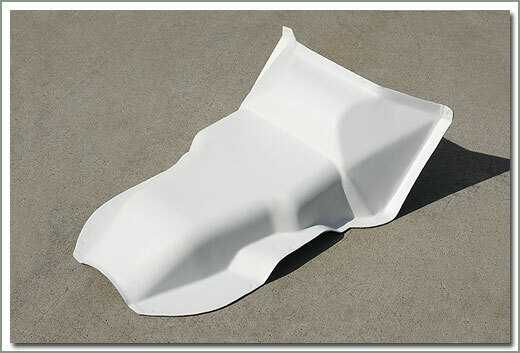 This reproduction fiberglass part is the same shape and design as the factory original. Fits 3 Speed and 4 Speed transmissions from 9/72-1978 40 Series. Solid built construction. Drilling is required, shift lever holes must be cut to fit. White gloss outer finish, ready for prep and paint. 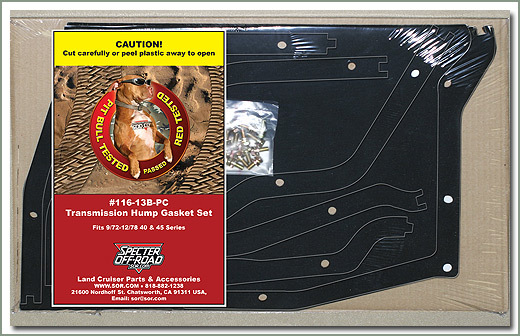 Complete the installation with SOR's precut transmission hump gasket set, see part # 116-13B-PC. designed to fit 3 speed 1965-9/72 40 Series. Drilling is required for mounting holes, shift lever holes must be cut to fit. Cowl drain holes are not cut out on this hump. Order precut transmission gasket set see #116-13A-PC, order separately. designed to fit 3 speed & 4 speed transmissions 9/72-12/78 40 Series. Drilling is required for mounting holes, shift lever holes must be cut to fit. Cowl drain holes are not cut out on this hump. Order precut transmission gasket set see #116-13B-PC, order seperately. Fits 1958-9/72 FJ40/FJ45 - Comes complete with self adhesive back weatherstrip, pre-punched screw holes, and hardware. Easy to install. Restoration quality. Fits 9/72-12/78 FJ40/BJ/45 - Comes complete with self adhesive back weatherstrip, pre-punched screw holes, and hardware. Easy to install. Restoration quality. 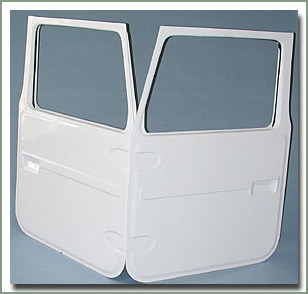 Toyota has discontinued manufacturing the factory right & left swing out rear doors, but Specter can offer you a reproduction set of Fiberglass Swing Out Rear Doors. These doors will never rust or rot out again. Built of heavy fiberglass laminates with molded in wood stiffeners, these doors are strong and solid. Rear door panels have the same styling as the original doors, designed to use the same factory hinges, latches and hardware, which can be purchased separately. 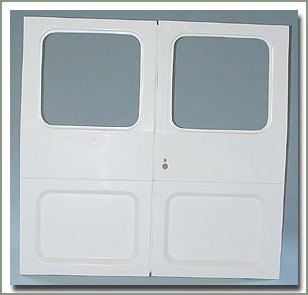 Doors have a white high gloss outer finish with inner raw fiberglass finish. Easy to paint, easy to install, minor drilling is required. Order door weatherstrip kit #133-03 to complete the job and your doors will look like brand new. Sold in pairs. Toyota has discontinued the factory rear doors, but now Specter can offer you reproduction Fiberglass Rear Doors to fit 1975-1984 FJ40 & BJ40. Just think no more rust or rot. These fiberglass doors are built using an inner and outer panel that are matted together. This makes these doors strong and solid. 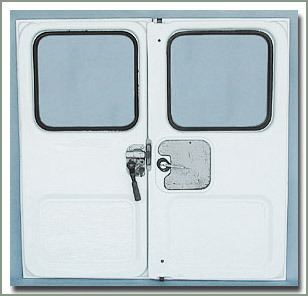 These fiberglass doors are built strong and have steel reinforced mounting areas for strikers. Doors are designed to use the factory hinges, regulators, handles, and mounting hardware which can be purchased separately. Doors have a white high gloss outer finish with a inner raw fiberglass finish. Doors can be painted. Easy to install, minor drilling is required, 1979 & later FJ40 & BJ40 will need to radius the lower corners. Order new door weatherstripping #136-03 and #136-04 to complete the job and your doors will be like new. FJ40 owners, would you like to have a drop down tailgate? The factory steel drop down tailgate was only offered on factory soft-top models or the short bed Pickup truck models. It's hard to find a factory steel tailgate in good shape! Specter Off-Road has done it again. 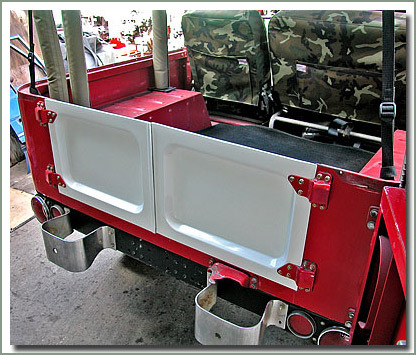 We now offer an inexpensive heavy duty Fiberglass Drop Down Tailgate. The Fiberglass Tailgate is built strong & solid, it is reinforced with a glassed in wood frame for support. Factory soft-top owners, and short bed Pickup truck owners this is a direct replacement. For 1961-1984 FJ40 hardtop models, minor drilling is required, and you need to purchase hinges and latches separately, see page 131. Fiberglass tailgate comes in a white high gloss outer finish, with a raw fiberglass inner finish ready for prep and paint.